Full day Excursion to discover the Dome in Monreale, famous for the gold mosaics representing scenes from the Old and New Testaments, Segesta to visit the Doric Temple and Palermo, the capital of Sicily. Full day Excursion to discover the beautiful town of Corleone, one of the attractive places in the environ of Palermo and is known primarily as the birthplace of Mafia. 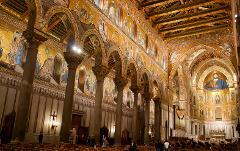 Then explore with us the amazing Palermo, the capital of Sicily. 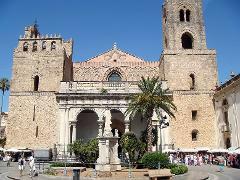 Full day Excursion to discover the beautiful and pleasant Cefalù, a charming coastal town which boasts a massive Norman Cathedral with outstanding mosaics. 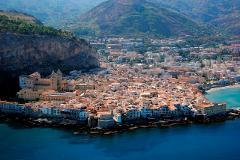 Later we will visit Palermo, the capital of Sicily. 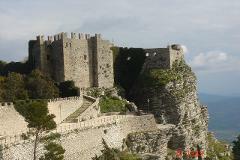 Full day excursion to discover the beautiful medieval town of Erice. 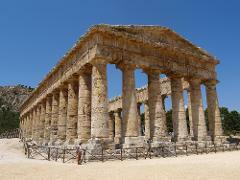 Then we drive through the Sea Saltpans of Trapani and we continue onto Segesta, to visit the unfinished Doric temple. We then return to Palermo port. Half day Excursion (max. 4.30 hours am or pm) to discover the Dome in Monreale, famous for the gold mosaics representing scenes from the Old and New Testaments and Palermo, the capital of Sicily.